Welcome to EKU and congratulations on your recent appointment! Below you will find information about our New Faculty Orientation (NFO) that will help to ensure your successful transition to EKU. The four-day NFO serves several purposes that promote faculty success. NFO provides new faculty members with information about policies, procedures, and teaching that will impact your work in the classroom and beyond. 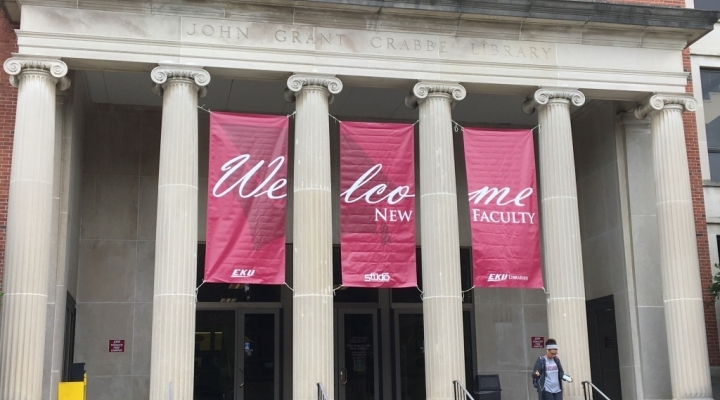 In addition, NFO offers new faculty opportunities to connect with EKU colleagues, campus leaders, and staff while also providing an overview of the many professional and faculty development resources and opportunities available throughout the year. Mid-year faculty hires (those beginning their appointment in January) should plan to attend NFO the following August. Please note that the resources and handouts below are provided here for your convenience. A small number of related handouts will also be available during NFO; the Resource Showcase will have additional materials from a variety of groups and departments. For new EKU Direct users, please follow this link for more information on accessing your account. In addition, here are some useful links to help make your start at EKU informed and healthy.